In 1895, deep in the Southeastern U.S., a sleepy little town is home to one of the most violent criminal families in the country. When Thomas O’Brien witnesses the brutal murder of his best friend and the kidnapping of his beloved Mary at the hands of the O’Malley brothers he thinks things can’t possibly get any worse. But when a mysterious stranger shows up to help, Thomas begins to suspect this man is more than he seems. This stranger pledges to help bring Mary safely back from the O’Malley brothers, no matter the cost. Tom’s real nightmare is about to begin. Damyanti also put together an eBook! 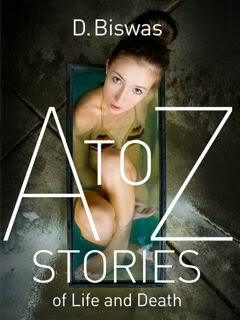 This is her collection of short stories from the A to Z Challenge. I was honored to be listed this weekend as one of her encouraging influences and will soon get to read this collection. Thanks so much, Damyaunti! And other eBook gems you’ve discovered lately? 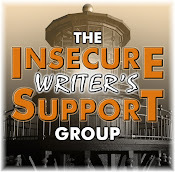 All right, you may now visit TS at The Non Review for my guest post! Both books sound very intriguing! Thanks for the heads up. Loved the title, A Dead God's Wrath. Definitely made me think of westerns, specifically Pale Rider. Sounds like an interesting read. Finally saw Capt America (I'm so pumped for the Avengers now) and The Devil's Double (starring Dominic Cooper who played Stark in Capt A; fascinating yet lacking in several areas to make it truly good). Off to check out your B Movies. Alex, dude, your kindness is killing me. Thank you. Self deprecation: still going strong after a lifetime of refinement. Thanks for the book info. I will have to check them out. Off to check Rusty Webb's book! Great list - got me frothing at the mouth...!! Hi Captian Ninja, both book sound a good read. Is Planet of The Apes only in film version now as it started many, many years ago on TV? Laila, would love to see my books made into movies. Just not by the SyFy Channel. Isis, Captain America was great! Rusty, time to change that! Yvonne, the new one is a reboot and ten times better than any film beofre it. I've got Rusty's book on my to read list. I'm wondering if I made a mistake going with a Nook last year. Too many books come out in Kindle only and Amazon and B&N don't play nice yet. Saw Rise and loved it. I was rooting for the apes all the way through. I didn't realize Andy Serkis (Golem) is Caesar. Wonderful job. This might sound stupid but what is a B movie? I mean what makes it a "B" movie as opposed to a non B movie, what woudl that be called? an A movie? I am being serious I have heard this term before and always wondered. I so do not do movies can you tell loool. Now off to check out thsi post to see if I can figure it out. that movie rocked my socks! Hey, I love Rusty's cover. Looks crackling. For Donna - It should be available on the Nook now as well. I hear they're great, and quite honestly, the epub format is much easier to deal with than MOBI. At least it was for me. Donna, that's why I love my iPad - I have apps for all of the readers! Dafeenah, a B Movie is a low budget commercial film, usually with lesser-known stars. It's a mid-list book as opposed to a best seller. Holy Cannoli, I'd buy Mr. Webb's book on the title and cover alone. Sounds great. Best movie so far this year (IMHO), is Harry Potter. Best TV show, Justified. Great heads up on the 2 books - the A to Z produced some really fine work - and I met some super people too! I'm headed over to the "B" movies with the "B" comments! I'm curious to see which ones you listed. Paradise 21 by Aubrie Dionne is an awesome book. I watched half of the Syfy movie this Saturday. Poor Jewel Staite's career is so far gone from Firefly that she's having to be in some horrible film about the end of the world. It seemed she had one facial expression throughout out the whole film because she was horrified she was in it. Haven't seen any movies lately, but I did see Elk, deer, and lots of raptors. The A to Z stories is such a brilliant, brilliant idea! I love it! Thanks for the review. Headed over to see T.S. and you! I wanted to see COWBOYS & ALIENS in 3D this weekend but my hubs and I have been sick with colds!! Instead, we watched some really bad SyFy movies on Sat night. No movies :( Boo. Hiss. Huntress, get it - you'll enjoy what's inside as well. Jules, that's really cool! There were some really great stories and posts from the Challenge. Patricia, Damy will appreciate that! Carol, movie review next Monday, I promise. A dead god's wrath sounds pretty awesome. Great title. No, didn't see any movies this weekend. Worked the fabric shop and then stayed in my jams all day Sunday. Congrats to both Rusty and Damyanti! I also loved Rusty's book. I read it in an hour. It's funny cause I blogged about it today too hahaha. Anyway, I got your blog addy from Mr. Webb...it's so pretty. I had to follow. I'm excited about Damyanti's book experiment, especially being so close to our hearts in coming as a result of the A to Z Challange. I wish her and Rusty a lot of success with both books. Now I'll check out the B movie post. 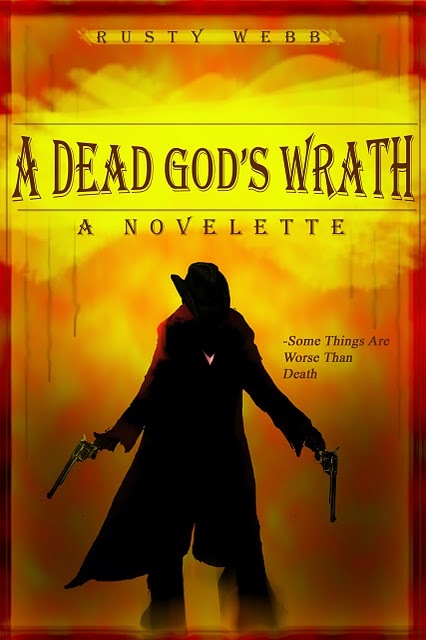 I read A Dead God's Wrath yesterday and loved it. I didn't realise Damyanti had released a collection of her A to Z stories. What a fabulous idea. Another to add to my TBR pile! Alex, thanks for sharing Rusty's book. I'm not a big horror fan but I like the blending of western and sci-fi. I'll check it out. No movies this weekend. But I just finished a good e-book, REVERB,(on Amazon) by an impressive writer, J.Cafekin. Let's just say I read all 300 pages in less than 48 hours and was sorry to see it end. Thanks again Alex for guest posting. I loved your list of films. That Novelette sounds pretty fantastic. I might have to check it out. Cube achieves its purpose: overwhelming. Flash Gordon saw the day of its premiere in Spain for over 30 years and found it very funny. Great reviews on the e-books. I need to read them. The A-Z stories sound like fun! Hooray for Rusty! Wishing him all the best with his novella! Charles, you should pick it up! Ellie, it was great, wasn't it? Sia, now that's some speed reading! Thanks for hosting me, TS! Leovi, that's funny you saw it as well! Love the title "Dead Gods Wrath". That's all you need, isn't it! Speaking of names. Just had to comment on a commenter. Isis, I love your name. I am an ancient Egyption nut. Those both sound great. We're on the same page today. I highlighted a few of my friends' recent releases too. I've never heard of them but they sound interesting. Thanks for sharing. Wow...I love Rusty's cover. Thanks so much for introducing these cool new books. I saw "Apes" yesterday, and LOVED every bit of it. Definitely the best movie of the summer, along with X-Men First Class. Wendy, you might have a new friend there! LG, I saw your post, and we sure did. Raquel, both of those covers are really cool. George, knew you would appreciate it! Ape really surprised me, because I am not a fan of the series. But Serkis nailed it with his performance. Rusty's book sounds great! I'm not normally a western girl, but add those twisty things and they suddenly have a ton of appeal. I actually read your guest post. Awesome except for the fact that I have a bone to pick with you about Treat. C'mon! He rocks! I just started reading "Machine of Death." So far it's awesome, but its more of a short story collection than a novel. Watched Soylent Green and Zardoz on dvd, then the last episode of Babylon 5. I'm having trouble remembering bad movies. They go into this abyss in my head where I just forget them. I think I might have to draw on some movies I just hated. Oh, congrats and all success to Rusty. Copyboy, he does rock - that's why Deep Rising was on the list. If it didn't seem like it before, Rusty definitely has confirmed his status as a writer with all that self-doubt surrounding his writing. I look forward to reading this recommendation. Thanks, Alex! I agree with most of your picks, but my favorite "DOA" (the original is somehow missing). Oh yeah, I already downloaded "A Dead God's Wrath" and hope to read it next week when we're on the road. Jeffrey, Rusty is a genius, he just doesn't know it. Patrick, really glad you downloaded it! Congrats to Rusty, book sounds cool. I smell affiliate links. But I'm okay with that. I haven't discovered any eBook gems because I'm staying clear of them for now. :P I love the paper kinds. But I've just recently acquired a phone with a Kindle reader in it so I think I should venture out into the eBook world soon. Elizabeth, you need to try them! Both books sounds great. Yay for the kindle! I've seen these book a few times today on other blogs. 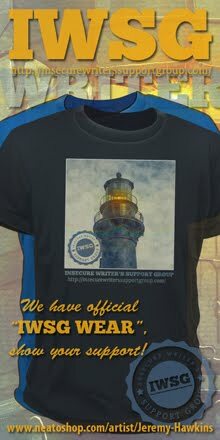 I love the power of the blogging community in promotions. Going to have to check them out. I haven't seen any of your B-movies but I probably won't. Thanks for letting us know about the book. Susan, the community is great and so are these books! Amy, you have to read them! Thanks Rachel...this book owes a lot to Alex and Lee who organized the A to Z challenge! Ellie, thanks! You may have read a few of them, but I replaced about 14 of the original...hope you enjoy them. It has been a labor of love. Susan, Amy, thanks and hope you enjoy the book if you decide to take a look. Alex, I'm downloading Rusty's book. Also, thanks for your relentless championing, and encouragement (all without asking you once). This is my first ebook, and though I've been published in print before, I never had as much fun or feel as much a part of a community. I've spent the last few days simply being grateful! I'm afraid that neither of these are on the Kobo store yet. I'll try to remember to check again later. Rusty's book looks intriguing, even though I'm not a big fan of horror. And this weekend, I saw Cowboys and Aliens and loved it! Rusty's western makes me think of High Plains Drifter... it's probably not really similar... but for some reason the blurb made me think of that old Clint Eastwood movie. My mom was an actress, and a large part of my childhood was spent at the Melodrama. One of the actresses my mother worked with was Verna Bloom. She played Sarah Belding in High Plains Drifter. She and my mom both had the same theatrical agent. Congrats on being honored by D. Biswas as an encouraging influence! I read your movie list, you have good taste. Day of the dead/ Evil dead 2/ reannimator/ the cube, all awesome films. Rusty Webb has a new fan! Loved his novelette. Damy, you are most welcome, and glad everyone is excited for your book! Tyrean, wasn't it just fun? Glynis, it was just amazing. i really need to get an ereader. I can't stand to read ebooks on a computer, so i def need an ereader to check all these out. Damn you lack of funds!! I can't wait to read Damyanti's e-book! It sounds fabulous! As a person who often selects books by their covers, I want to say Rusty's cover art rocks. Rusty's story sounds awesome and you know I just came back from reading your list. LMAO all the way, I loved those titles. Hey Eternally! Good to hear from you. Sarah, you do. I recommend an iPad of course. Patricia, his cover is awesome. Melissa, glad I could amuse you! Thanks for the info on the books. If you recommend it, I'll read it! Oh and that "B movie" list... really? D&D? I didn't know there was a movie for that. My gosh, brings back childhood memories. Silly, huh? I'm glad Cube is on your list! Cube 2 was pretty bad too! That's pretty awesome that a book came out of the A to Z Challenge. Thanks, as always, for all the golden info, Alex. I'm still on the lookout for Carbonite Crunch. Well the price is right. 99 cents for an e-book. Awesome! Will check out the guest post. Thanks for the heads-up on the ebooks! The first ebook sounds pretty cool. I love period thrillers. Oops, that didn't come out right. I love your picks~ These books look intriguing, too! Aleta, it's not good, but for D&D geeks, it's so bad it's fun! Kid, Cube 2 was just a rehash. Robyn, if anyone can find it, I know you can! Copyboy, care to try again? I haven't really read any eBooks yet! I really want to but I'm too busy writing or reading printed books! And the only movie I saw over the weekend was Star Trek and that was pretty cool! Other than that, I was too busy editing my novel to do anything else LOL! I'm looking forward to reading your 'worst movies' fest. Sounds like fun. I really enjoy novels set during the late 1800s. I may have to check that out. I'm currently reading The Hunger Games. I'm late...I know. The Planet of the Apes saw her first child and was marked in my memory forever. I hope that Rise of the Planet of the Apes is so good. Leovi, it's an excellent film. That first book sounds like it would be a good read...the second I want to read to see how the A-Z Challenge morphed into book form. Best B Movies? Awesomesauce. "Sorority Babes in Slimeball Bowl-o-rama" tops my list.